The first midterm of the second semester lies in our fresh tracks and I am still buzzing from adrenaline, lack of sleep and too much caffeine. I had planned on getting a good night’s sleep before this one, but I ended up staying up until 2:30 a.m. practicing drawings and flipping through flashcards about the development. Skjalg stayed up with me for most of the night and headed to bed an hour or so before me. Until then, we quizzed each other and practiced presenting the drawings on the giant whiteboard Skjalg got from his group for his birthday in December. 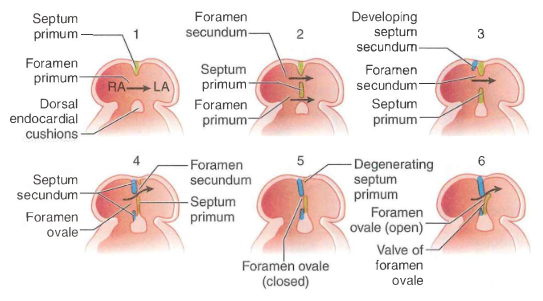 For the first part of my midterm, I was asked to draw the development of the interatrial septum, describe its function in the fetal stage and then what happens to it after the baby is born. I was asked questions about the mechanisms behind its closure (first breath – building pressure in the lungs – higher pressure in systemic circulation). I was really, really happy that I was asked this drawing. It was a drawing that I understood well enough to draw in different ways/from different angles and would therefore be in a much better position to answer any questions they had. In my first anatomy midterm last semester, I was asked to draw the facial canal and he didn’t like the way I was drawing it, so I had to redraw it using a three-dimensional diagram that he sketched on the board. Its something that’s easy enough to do when you understand it, but horribly unnerving when you don’t. That’s all I can remember for now…All in all, my exam took – what felt like – less than 4 or 5 minutes. The most time-consuming portion was the drawing, though that wasn’t as bad because I asked if I could explain it as I drew it. When I was done, it was like I had no memory of the last 12 hours. There was so much stress leading up to that point and it was over in just a few minutes. I was the last person to be examined, so I was left in the room with the examiners and one other group mate while everyone else was excused. Being the last person is possibly the most stressful (since you are sitting there for an hour watching everyone), but this time it was really nice. There is a lot less pressure when you don’t have your whole group witnessing your exam. I ended up with a 4/5 – so I am one satisfied girl. The exam was much easier than I anticipated, so the only thing I am a little bummed about is that I could have passed without staying up all night last night. 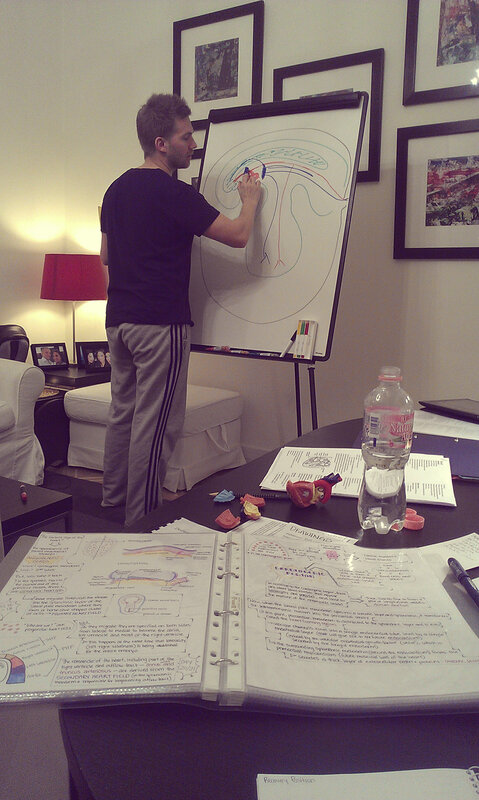 The next one up is biochemistry on Tuesday. I have been staying on top of my topic list for that class, but am behind on the structures – a total of 64 that we need to be able to duplicate on the exam. Our Medical Professionalism lecture today was cancelled, so we gained 2 hours. Time might be more precious than gold to medical students. We all have our different “midterm day” rituals. Some went out for beer and cheesecake, others straight to the bar, some home to relax for the rest of the day and others either home to study or prepare for classes they have later today. While I would love to just check out and watch movies and sleep, I am going to force myself to be productive and maybe head to bed early. I’ve been compiling a little list of tasks I need want to have completed by the end of the day. A little overambitious, but I guess that’s my vice. None of them really have to be done by tomorrow, but I know that getting them done today will make the coming days much easier to handle. If I learned anything from last semester, its that I need to keep a strong pace during the semester and not let anything fall by the wayside. Now, for my favorite post-exam ritual: closing all the tabs, windows, files, etc that I no longer need open. Skjalg says I am a tab-hoarder (because I never close my tabs when I am studying). § 4 Responses to Heart Midterm: Check! Haha, only you would pick up on that! I didn’t even notice that I made a pun-ny! They went fine, but then a new to-do list arose! It’s like cutting off medusa’s head! Perfection in words – Charlotte strikes again! « Midterms, cadavers and surgery – oh my! 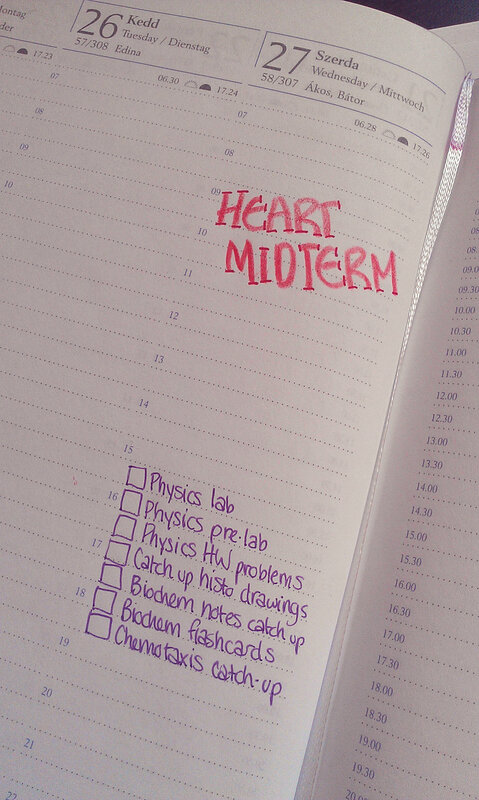 You are currently reading Heart Midterm: Check! at Buda-B.